OLD PARKED CARS. 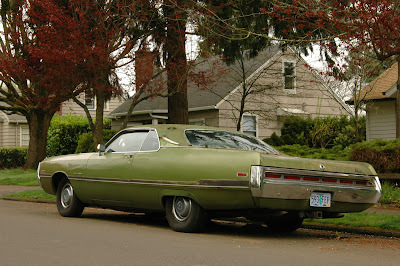 : 1971 Chrysler 300.
love the hidden headlamps. it actually looks like a muscle car instead of a luxobarge, but boy does it look long in these pics. in person they look somewhat shorter. this thing is quite the looker. that olive green is a good color for that car. That front! That back! That trunk! Awesome! The ratio of cabin to trunk to hood is ridiculous. Man, that thing is great. Fantastic! What an absolute beast...I would totally drive that. It's the hulk car with the hulk trunk for all those dead enemies with room for hulk food. It's quite strange how repulsive and attractive this car is, almost pornographic. That trunk looks photoshopped. The low angles really make it look like the pickle-barge that it is. 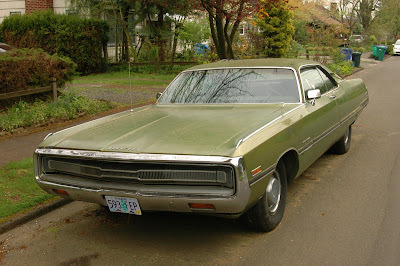 I can't think of a car that embodies the word "barge" more than this. Stunning front end, so glad you found this. Hard to believe that 15 years earlier these 300s were setting Flying Mile records on the beach at Daytona. By 1953, France knew it was time for a permanent track to hold the large crowds that were gathering for races. Hotels were popping up all along the beachfront. On April 4, 1953, France proposed a new superspeedway called Daytona International Speedway. France began building a new 2.5-mile (4.0 km) superspeedway in 1956 to host the new premiere event of the series – the Daytona 500. In 1958, the Daytona Beach road course hosted its last event. The first Daytona 500 was held in 1959. Daytona Speed Week on only the beach sand and not the adjoining road, continued however through 1961 with time /distance records for the standing mile and flying mile in multiple classes. The six fastest stock cars ever on the beach were the 1960 Chrysler 300F Specials...."
"...In 1900 the steam car was broadly superior and even managed to hold absolute land speed records..." Beach racing the flying mile. There happens to be one identical to this one up the street from my house, I've talked to the lady a few times over the years trying to get her to come down some on the price. It'll be mine soon enough. Flat black, brushed aluminum trim, layin on the rocker panels, with red steel wheels and fat white wall tires and an all white interior. Always love the fuselage look of 69 thru 71 Chryslers. 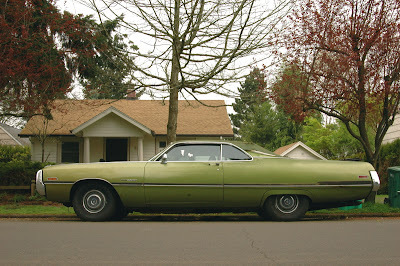 Friends of the family had a 69 Custom Newport sedan. Could fit 6+ kids in the back seat with room to spare.